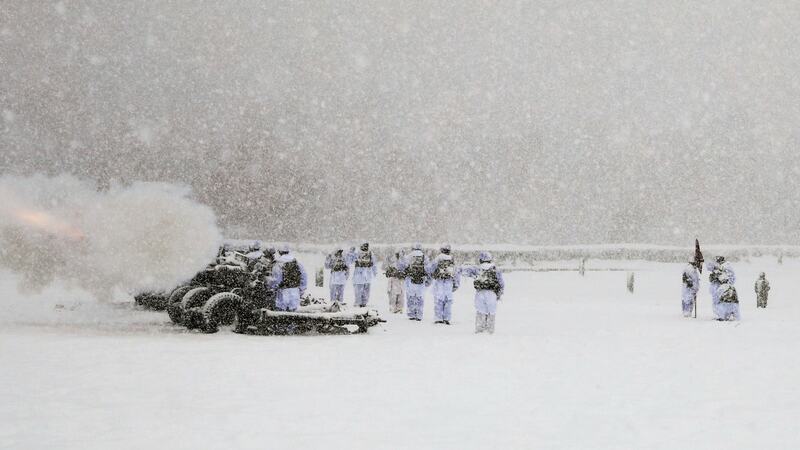 Soldiers of the New York-based 10th Mountain Division stood tall in swirling snow and ice for the traditional 21-gun salute fired in honor of a passing President earlier this month. The Fort Drum-based unit, near Watertown in upstate New York, honored the late 41st President, George H.W. Bush, on Dec. 6 with a salute fired by howitzers of the 3rd Battalion, 6th Field Artillery Regiment. A light infantry division, the 10th Mountain traces its lineage to the 87th Mountain Regiment in World War II, which trained specifically for combat in mountainous areas, fighting first in Alaska and later in the Apennine Mountains of Italy during the conflict. “The late President Bush served in World War II, then of course, our division’s history – the 10 Mountain Division’s history fighting in Riveredge and taking Mount Belvedere in these conditions during World War II so it’s a pretty historic event that we get to do this ceremony in the conditions like our division fought with President Bush in World War II,” said Command Sgt. Maj. Russell Blackwell of the salute. According to the National Weather Service, Watertown registered a low of -6° on Dec. 7.